Figure 1. Untreated plot (left) and Pronamide (Kerb at 2.5 pints/A) applied via drip tape (right) 30 days after transplanting of romaine lettuce. Areas most distant from drip tape that supplied herbicide show weed survivorship. Over the years of Kerb use in lettuce (more like decades) there has been a lot of work on application methods. Our transplanted lettuce in southern California is usually grown on drip and when possible, we like to apply all things through it. Our fields are surrounded by four cities and folks there just don't seem to enjoy sprayer rigs that much. 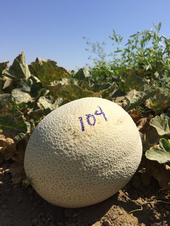 The cantaloupe industry in California is in the middle of a huge paradigm shift, transitioning from classic western shipper varieties that require multiple harvests, to new Harper varieties, also known as LSL (Long Shelf Life) melons. Purported benefits include less labor at harvest and prolonged superior quality at the grocery store. Examples of Harper-type melons are the Infinite Gold, Fiji, Caribbean King and Caribbean Gold. Due to grower and buyer interest, seed companies are rapidly expanding the number of varieties with this trait.